BERLIN, Germany -- Many different types of animals come together to form vast groups � insect swarms, mammal herds, or bird flocks, for example. Researchers in France added another example to the list, reported today in the online journal PLoS ONE: the huge Wels catfish, the world's third largest and Europe's largest fresh-water fish. Researchers observed these fish in the Rhone River from May 2009 to Feb. 2011 and found that they formed dense groups of 15 to 44 individuals, corresponding to an estimated total biomass of up to 1132 kilograms with a biomass density of 14 to 40 kilograms per square meter. 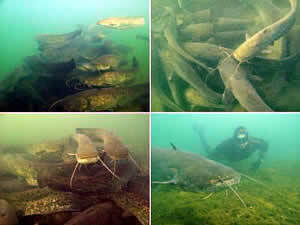 Unlike traditional behavior seen in schools of fish, the catfish in the aggregations did not all point in the same direction and sometimes came into contact with their neighbors. Researchers were not able to determine the reason for this behavior, though they ruled out reproduction, foraging, and safety from predators. The species originates from Eastern Europe and is not native to the Rhone, so the researchers were curious what effect these large aggregations may have on the local ecosystem. They calculate that the groups of fish could excrete extremely large amount of phosphorous and nitrogen in their waste, creating potentially the highest biogeochemical hotspots reported in freshwater ecosystems. According to the authors, "our study is unique in identifying unexpected ecological impacts of alien species. Our findings will be ground breaking news for many scientific fields including conservation biology, ecosystem ecology and behavioral ecology and anyone interested in biological invasion and the potential ecological impacts of alien species. Therefore, we believe that our manuscript will stimulate further research and discussion in these fields."